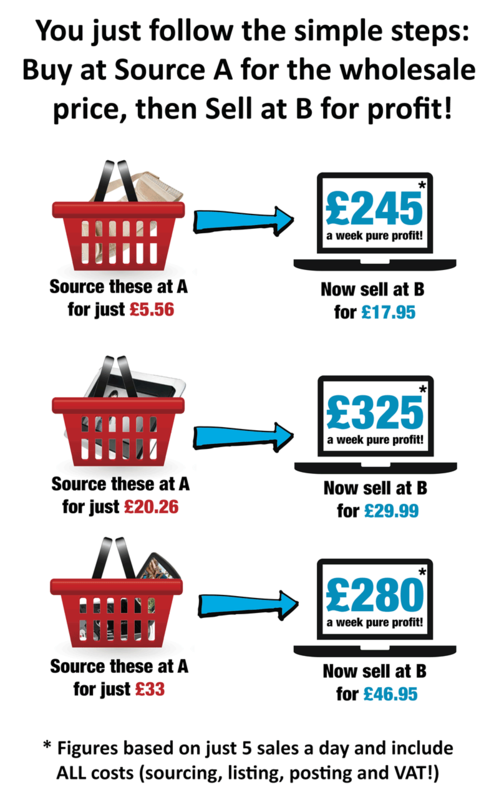 Do you know the number ONE challenge people find selling online? It’s knowing which items are actually going to sell. Listing products on eBay or Amazon is easy, but picking products that people will buy time and time again and leave you with a healthy profit margin is hard. When I started out selling online in 2005 I would spend hours every evening researching which products to sell. As soon as I’d put the kids to bed, I’d scurry off to our battered old laptop on the kitchen table and get to work. I’d scour hundreds of different listings trying to spot the right ‘hot products’. First I’d scribble down the sale prices… then the volume of sales for individual sellers and finally at the end I’d put the whole lot together and try to make sense of it all. out to be anything but! I’d work out wholesale costs, the posting and packing only to discover the profit margin was tiny and I was back to square one. I felt deflated and hopeless. Like I was constantly fighting an uphill battle. I was approaching it from completely the wrong angle. I was looking for the ‘obvious’ best-sellers. The blockbuster trends… the latest toy… fashionable items which every man and their dog were falling over each other to sell. The problem is when you target these obvious best sellers there’s too much competition. Everyone around you is trying to do the same thing so they lower their prices to get the sales. Though you might make some money after all your sourcing costs, listing fees and postage and packing, your profits are razor thin. Healthcare, pets, baby products… seasonal clothing. I quickly found thriving little understocked markets where the items were being snapped up almost as fast as the sellers could list them. Better still, because these were often generic, unbranded goods they could be easily sourced from wholesalers at a low price. I dedicated all my time to uncovering these ‘secret sellers’ which offered consistent sales and great profit margins. 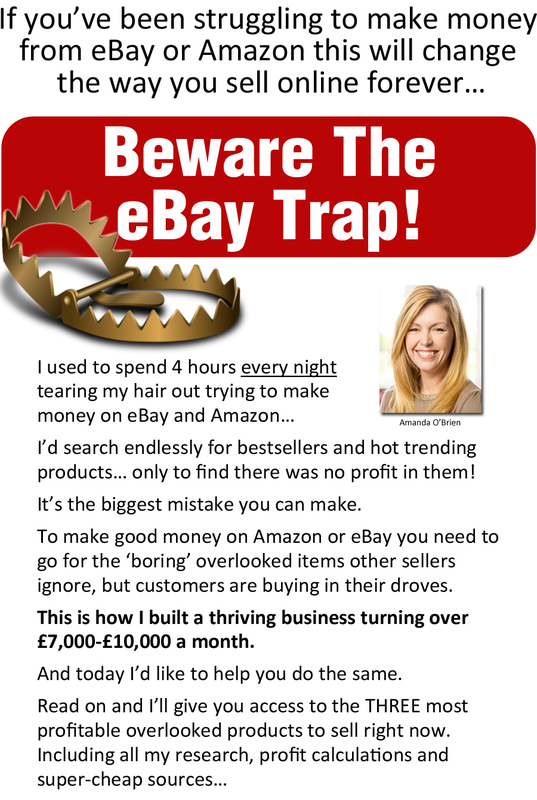 I perfected a formula for identifying these products and just as importantly, finding reliable wholesalers where I could source them easily and I developed an eBay business turning over in excess of £7,000 – £10,000 every month. Except the big difference is I’m going to do all the hard work for you. I’m going to show you a way to sidestep all the stress and skip all the boring, time consuming bits. Traditionally couples look to specialist shops on the high street to buy the items they need for their big day. But weddings are notoriously expensive and I noticed a growing number of savvy shoppers were starting to look online for certain items. Rent them from one of the major suit and dress hire shops on the high street and you can end up spending a small fortune for something that’s only going to be worn for a few hours. But buy them online and you can pick up a fantastic dress – the same or even better quality – that the bridesmaid can keep! No need to return the items afterwards… and no unnecessary strain on the budget. During my in-depth research I pinpointed a particular style of classic bridesmaid dress which could a) easily be sourced from a trusted, reliable wholesaler and b) left a great profit margin after fees and postage and packaging. The dress I found would have netted you £14.27 pure profit per sale. And one clever seller has grossed approximately £69,256 from sales of these alone! Or you could let me do all the hard work for you. Because I actually ENJOY doing this stuff. I get a real buzz from uncovering these hot sellers, because without blowing my own trumpet too much, I’m really good at it. over £7,000 – £10,000 every month! 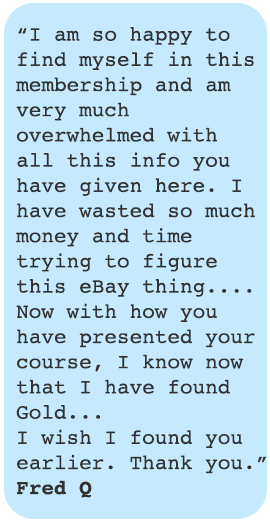 I’ll never forget the moment when I realised I had made enough money from my eBay sales in my spare time to quit my full time job. The excitement and the butterflies I felt typing out my resignation letter and knowing that from now on, I was in control. I don’t miss the boring commute to work … the endless meetings… the restrictions… the long hours. And that was just the start! When I hit sales of £5,000 a month… and then £7,000… and then £10,000 I had to pinch myself. The best thing about sourcing and selling products online on eBay and Amazon is that you have control and how much you make is entirely down to you – there are no limits. That’s the best thing about this. All the products I share with you are proven sellers, with easy access from wholesalers, low competition from other sellers but high demand from buyers. It’s completely scalable. Want to make more money? Simply set aside more time and list more items… or sell more of the hot products I recommend each month. I would treat it like target setting. If my husband and I wanted to take the kids away for another holiday (we’re unashamed sun worshippers!) I would simply look at it in terms of sales. If we make just 8 more sales a week of these doggy coats… and continue to do that for the next 2 weeks we’ll make enough money to pay for all the flights. If we continue to do that for 4 weeks we can stay in our favourite resort and splash out on some really fancy meals. It might sound bonkers but it’s a magical feeling, knowing that you can set yourself clear, actionable goals and achieve them. A big part of the Source Report is motivation and I’ll be right there to give you support, guidance and encouragement when you need it. How much, realistically, could you make from this? How much you make from this depends on you, how much time you want to dedicate to this and which products you decide to focus on. But to give you an idea here are some more examples of the kinds of hot products I’ve shared with members in the past. And remember these figures are calculated after all costs, your listing fees, your postage and packing, so there are no nasty, hidden surprises! You can simply list the items I recommend each month and derive a consistent income from these. As you’ll discover this is low-hassle, easy and consistent and you can make great part, or full time returns doing just that. 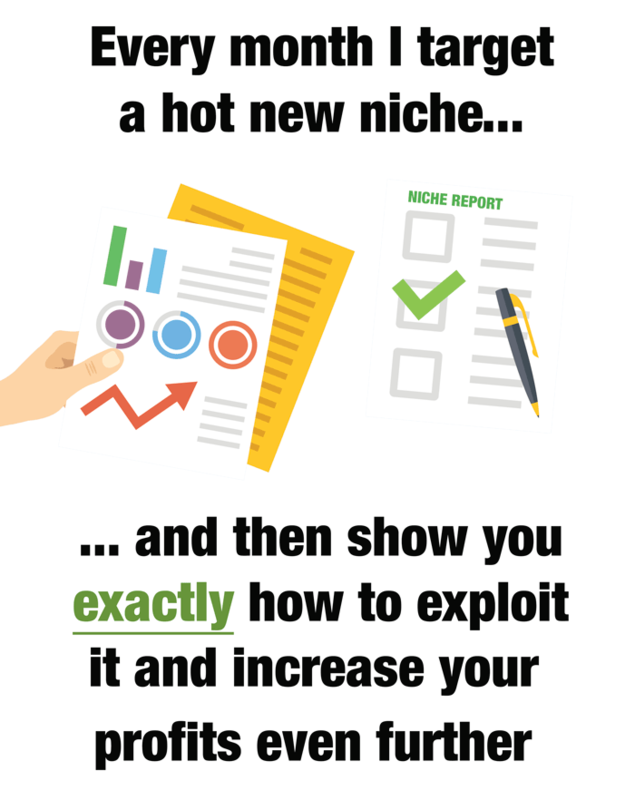 As part of your membership you’ll get exclusive access to my brand new monthly ‘Niche Buster’ report. Each month I’ll focus on a brand new niche – time sensitive and relevant to the upcoming months, or season I release it. It could be sport… festivals… electronics – literally anything which I’ve identified as having mass market appeal and a ready selection of products and buyers that you can easily tap into. And this isn’t just a ‘tag on’ bonus – this is a major part of the service. Every in-depth report includes meticulously researched stats and practical steps. 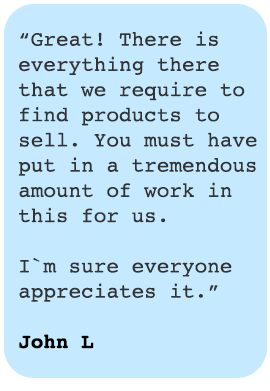 1) If we’re all selling the same products we’ll dilute our profit potential. I’ve been running the Source Report for over 5 years so I know the optimum number of members to allow the community to thrive while protecting our profits. 2) I want to be able to support you each step of the way. If there are too many members I’ll have to spread myself too thinly. The Source Report is a small focused community where we help each other, not a big, faceless corporation. The easiest and best way for you to see the changes that have taken place at the Source Report and discover if it is right for you is to try it for yourself. Normally the Source Report is just £29.95 a month. I think that’s a drop in the ocean when you consider that just ONE of the hot products I recommend each month (remember you get THREE hot products, as well as your in-depth niche report) could make you in excess of £325 a week pure, net profit. But to remove all the doubt and worry and to give you the space to try it out without worrying about upfront cost, I’m going to let you try it today for just £9.95. That’s £9.95 for everything. 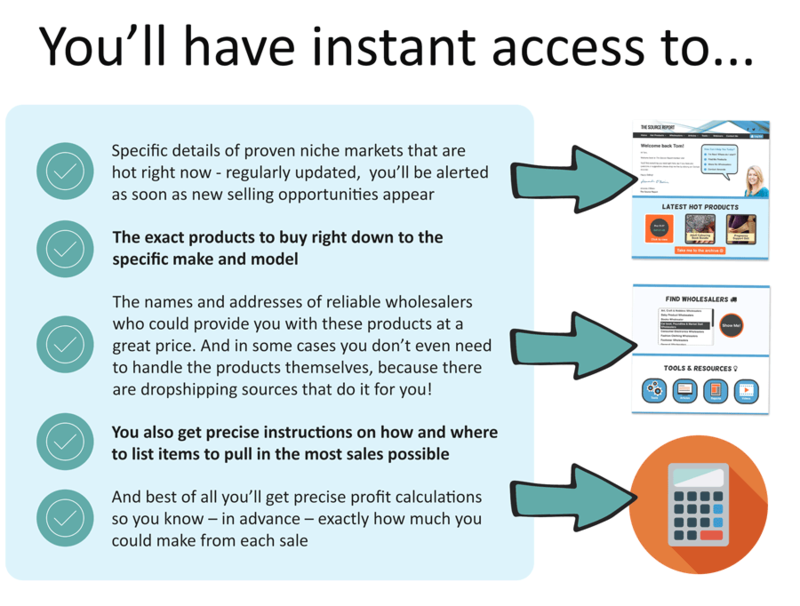 Access to all the hot products, the wholesaler directory, your monthly niche buster report, as well as all the how to videos, articles, tools and full support from me. If you decide it’s not right for you for any reason, just drop me a line in your first 30 days and I’ll even refund you that £9.95. I only want you to continue subscribing to the Source Report if you are genuinely benefiting from it and using it to increase your online sales. I’ve specially prepared these free, bonus reports for you to welcome you on board. They cover the online selling and sourcing essentials and address some of my most asked questions from members. 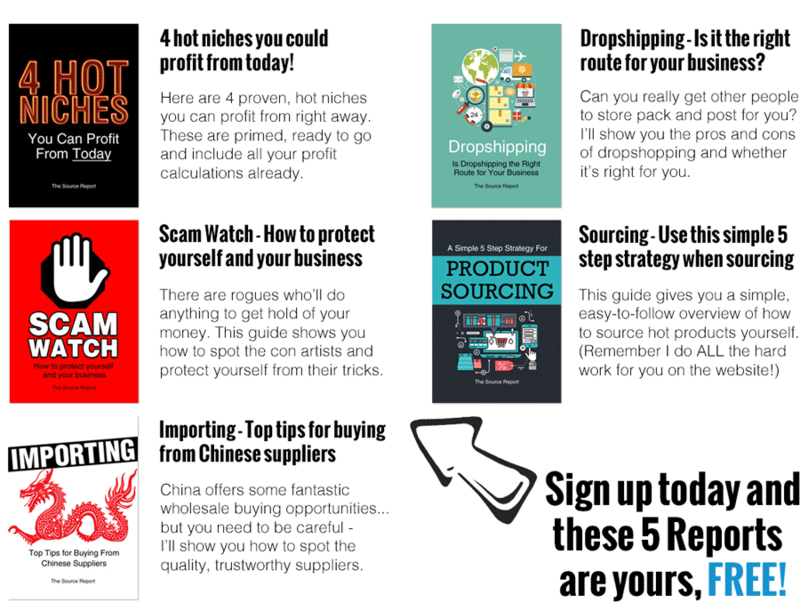 Sign up today and you’ll get instant access to all 5 of these free reports, which are yours to keep whether you decide to stay on or not. With the Source Report you get regular specific and professionally-researched recommendations of exactly what you should be selling and where to buy it from. All you have to do is follow the simple steps. I know there’s a lot of information to take in and I’m sure you’re keen to get started, so please click on the orange button to take advantage of your risk-free trial (remember you get a full 30 days) and enjoy! You’ll have everything you need to run a very profitable online selling business for yourself. 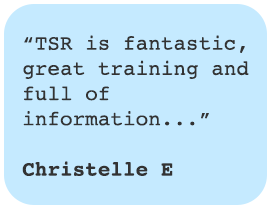 We’re a friendly community which encourages and motivates and I can’t wait to start working with you. Just click on the orange button now to start your risk-free trial and I’ll see you on the inside! Disclaimer: Information in the Source Report is time sensitive and though correct at the time of publication, examples given may not still be valid.